...The Gospels contain a fairystory, or a story of a larger kind which embraces all the essence of fairy-stories. They contain many marvels—peculiarly artistic, beautiful, and moving: “mythical” in their perfect, selfcontained significance; and among the marvels is the greatest and most complete conceivable eucatastrophe. But this story has entered History and the primary world; the desire and aspiration of sub-creation has been raised to the fulfillment of Creation. The Birth of Christ is the eucatastrophe of Man's history. The Resurrection is the eucatastrophe of the story of the Incarnation. This story begins and ends in joy. It has pre-eminently the “inner consistency of reality.” There is no tale ever told that men would rather find was true, and none which so many sceptical men have accepted as true on its own merits. For the Art of it has the supremely convincing tone of Primary Art, that is, of Creation. To reject it leads either to sadness or to wrath. Although Tolkien wrote these words some years later than The Hobbit, they are an insightful window into his literary world. Additionally, the quotations above (and many others like it from this essay and Tolkien's letters) provide the reader with a bridge from the literary, sub-created world of Middle-Earth to the world outside the pages (even though Tolkien saw those two worlds as closer than most people realize). This is of chief importance when it comes to discussing the Christian worldview of Tolkien, his approach to writing fairy stories, and the applicability of literature in the realm of Christian apologetics. It has often been noted that this is true for works of writing such as C.S. Lewis's beloved Chronicles of Narnia. But could this also be true of Tolkien's works, or others for that matter? I think it can. And so it was in this vein that I quoted a few of Tolkien's words above in a recent radio interview on KFUO's new show Cross Defense. From what I can tell so far it is a much needed antidote to the lack of apologetics in Lutheranism, broadly speaking. I am thankful for the work and attention of Rod Zwonitzer and those who have worked hard to make this program possible. I was also glad to be a guest on the show this past Monday and discuss two of my favorite things, literature and apologetics. We spent a great deal of time working our way up to the primary content of the discussion on how the Christian faith is depicted in good works of literature, such as The Hobbit, even if it is more subtle there than perhaps it is in other works, especially those by Tolkien himself. We also discussed the recent movie, comparing and contrasting (though mostly contrasting) it with the book, among many other things. If you're interested in learning and exploring more about this aspect of apologetics (what is often called right-brained apologetics, or apologetics for the tender-minded), or want to know more about my thoughts on the recent Hobbit movie, I've posted a link to the radio show at KFUO here. In brief, however, apologetics for the tender-minded seeks to use works of literature, music, and the arts as bridges to communicate the Christian faith. We tell stories every day. Think about our conversations with family and friends over the phone or at the dinner table. We also tell stories when it comes to our religious (whatever that may be) positions. Whether someone is an self-professed atheist or a confessing, orthodox Christian, our worldviews are also stories; they tell us about who we are, where we came from, where we're going, and the like. Also, each religion of the world tells a story about god, man, sin (or lack there of), salvation, eternity, and so forth. Approaching apologetics this way is different from the typical questions and answers from skeptics that we are used to. But it is nonetheless important. For many, the question: "Is it true?" is not the one they are asking, even though we should encourage them to ask this about their assumptions and worldview. Lately I've noticed that many people are asking, "Why does this matter or why should I care?" This is where right-brained apologetics steps in, using literature, music, and the arts as bridges or windows into the Christian worldview and even glimpses of the Gospel. 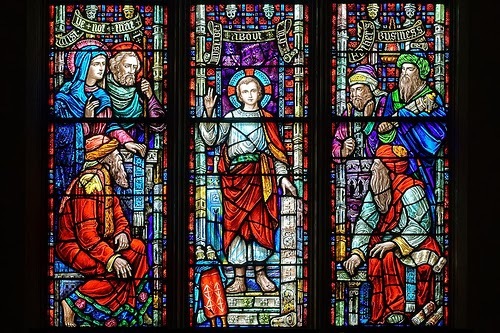 (Think of stained-glass windows being a visual sermon, or paraments and church architecture communicating Christian doctrine). Christianity ends up answering both our intellectual questions and existential needs. Christianity not only has the one story which claims to correspond to the world and the facts around us but it also claims to have the best story, the one that is most beautiful. For a Biblical example of this read Paul's exchange with the stoic philosophers in Acts 17. Not only does he argue for the truthfulness of Christianity on an intellectual basis, but he also does so existentially, using their own writings subversively in order to proclaim the Gospel, taking the truth that was mixed in with the lies to point to the one who is the Way, the Truth, and the Life. Finally, if you'd like to read some good essays on apologetics for the tender-minded, I'd recommend reading Tolkien's essay On Fairy Stories, C.S. Lewis's essay Myth Became Fact, and John Warwick Montgomery's edited collection of essays titled Myth, Allegory, and Gospel. This is what separates Christianity from all the world’s religions. God is “beholdable.” He is not mythical or unapproachable. He is not distant or absent. In Jesus, God is approachable, knowable, tangible. Men saw Jesus, heard him, touched him, ate with him. Jesus is no mythical figure; he didn’t live in “never-land or” “once upon a time” or “in a galaxy far, far away.” He was born in the days of Caesar Augustus. Crucified Under Pontius Pilate. The Christian faith – just like Jesus – is historical. And this makes John’s confession all the more remarkable. When John stands in the wilderness and points to Jesus saying, “Behold, the Lamb!” he’s pointing to God in human flesh. God with a human face. God who is truly bone of your bone and flesh of your flesh. Behold, the Lamb of God who takes away the sin of the world. And in the Scriptures, a Lamb means one thing: Sacrifice. Sacrifice is God’s way of covering our sin and guilt. Sacrifice is God’s way of taking our death and giving us life in exchange. The Lamb meant sacrifice. Substitute. A life for a life. The innocent for the guilty. As John cries out, “Behold, the Lamb!” three OT events come to mind. 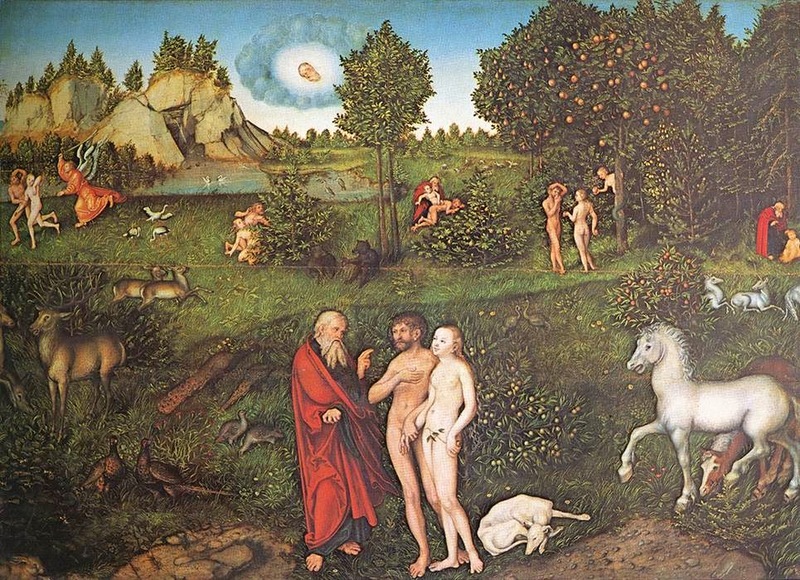 After the fall, God clothed Adam and Eve’s nakedness and shame. And God did this with animal skins. Seems ordinary enough, but where did those skins come from? That’s right…sacrifice. A substitute. A life for a life. The innocent for the guilty. There are even some reformation paintings depicting a lamb as the animal whose life was given and blood was shed to clothe Adam and Eve. And he did. The Lord provided. Finally, we can’t forget the Passover lamb came. There the guilty sinner would place his hands – and his sin - on the Lamb. And the Lamb would die. Sacrifice. Substitute. A life for a life. The innocent for the guilty. Guilt covered. Sins forgiven and atoned for. Blood covered the doorpost. And Israel ate the flesh of the Lamb who was slain for them. All of Old Testament history – the tabernacle and temple – all of it is soaked in sacrificial blood. All of those OT rams and lambs and sacrifices find their fulfillment in John’s words. Jesus is the Lamb of God whose blood cleanses us from all sin. 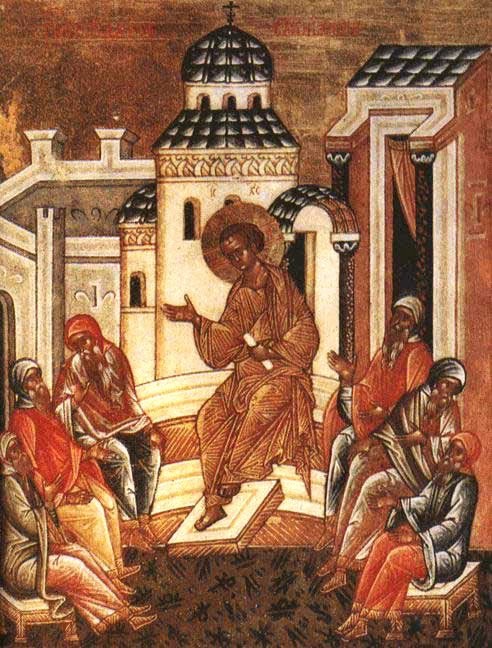 John points us to Jesus. 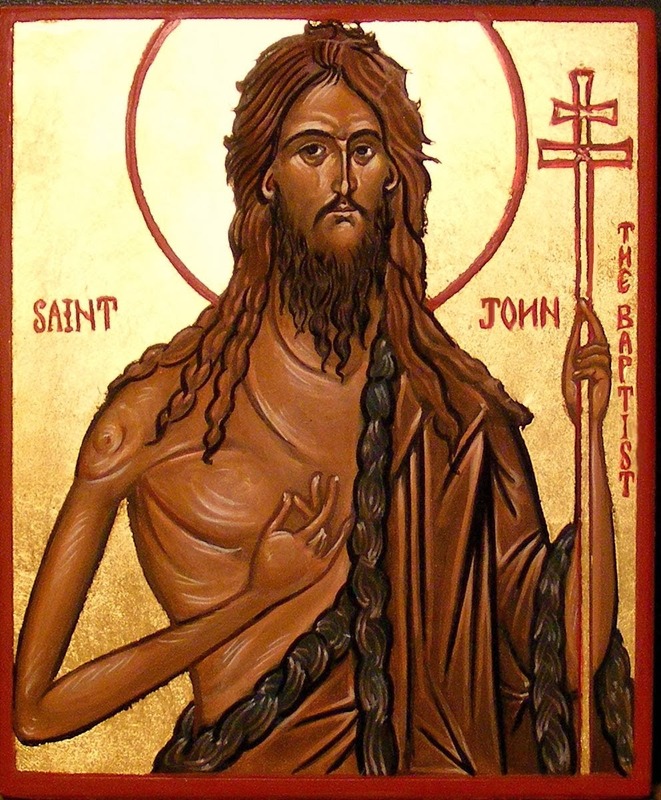 Some of the best artwork of John the Baptizer displays his bony, weathered elongated index finger extended, pointing to Christ Crucified. John must decrease. Jesus, the Lamb of God must increase. John’s finger points us to the cross and to our Savior. But where do our fingers point? Behold, the sins of…well, anyone else but me. That’s how we prefer it. It’s easier to behold the sin in the lives of our family members, friends, and fellow members than it is to admit that we’re sinful and unclean. It’s easier to drag up the sins of others like crab off the HB pier and show them off to the world than it is to admit that we like sheep have gone astray. It’s easier to point our finger at others’ sin than to admit that we are poor miserable sinners. But God’s Law doesn’t let us point fingers at others or their sin. The finger of God’s Law, the same finger that engraved his commands in stone, points us to the mirror. Behold, the sin of the world that take away the Lamb of God. Our boasting and pride led to his suffering and humility. Our loveless hearts led to his betrayal and abandonment. Our guilt and sin, led to his judgment and death. Notice that John says “sin” not just sins. Jesus goes to for the jugular of our condition. Not only does he die for our sins, Jesus becomes Sin for us. Jesus becomes the blasphemer, the murderer, the adulterer, the thief, the liar, the cheat, the gossip. He becomes Sin in order to put Sin to death in our flesh, in His flesh. This innocent, spotless, sinless Lamb of God takes up our sin. He is the cure, the medicine, the antidote. The sting of Death is Sin. He took the sting, He absorbed its venom – the Law that kills us. He died with it. It killed Him and in dying, He conquered Sin. And if Jesus has taken away your sin. You can’t have it back. It’s not yours any more. It belongs to him. 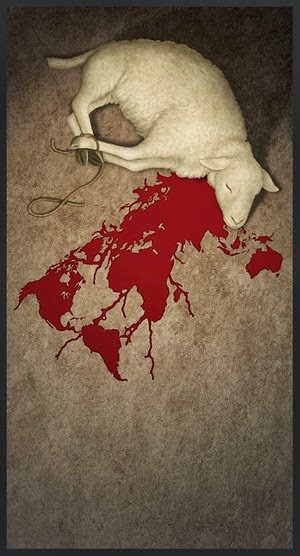 For a Lamb means sacrifice. A substitute, a stand-in. Jesus’ life for your life. His life’s blood in exchanged for yours. Looking back upon Redeemer’s 50th anniversary, this is what it was all about. 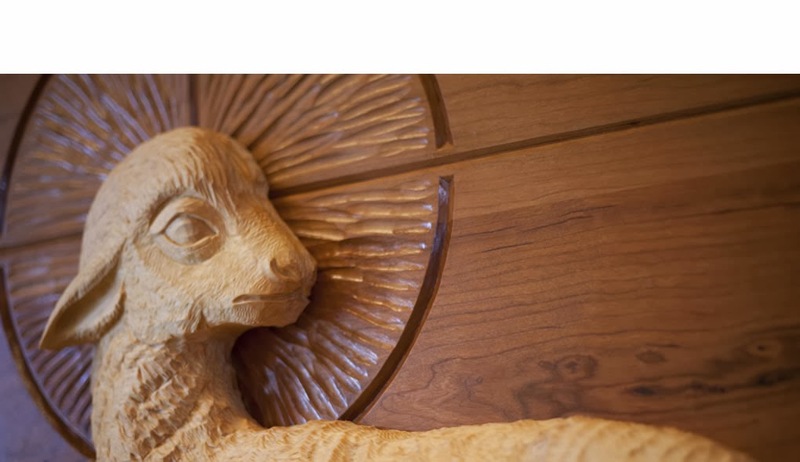 Remembering 50 years of pointing our members, preschool families, and community to Jesus, the Lamb of God who takes away the sin of the world. This is what Pastor Harmelink has been doing here in this congregation for the past 17 years, week in and week out, proclaiming “Behold the Lamb of God who takes away your sin.” This is what he’ll continue to be doing in St. Louis: Behold the Lamb of God who’s been taking away the sins of the world throughout all our church’s history. And what a blessed history it is. You see, John’s words are also the church’s words. John’s confession is our confession. 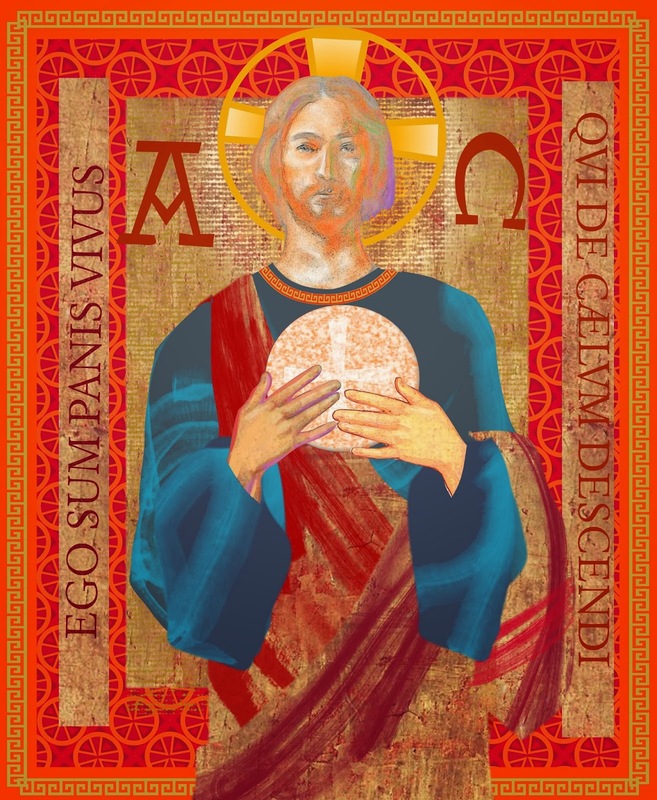 Today, Redeemer stands like John in a wilderness: a wilderness that devalues and dehumanizes life from womb to tomb; a wilderness full of creature comforts with little care for God’s unborn indefensible, outcast, homeless creatures; a wilderness that mocks Christianity and martyrs Christians in unfathomable numbers; a wilderness that revels in man’s increase and Jesus’ decrease. And so each of us a little “John the Baptizer”, pointing to Jesus and declaring to Huntington Beach, our friends, our co-workers, our neighbors, and everyone in need: “Behold, the Lamb of God.” Evangelism really is that easy. Caring for our neighbor is that easy. That’s what our preschool does for children and families. That’s why this congregation wants to support Hispanic ministry in our community. That’s what goes on daily in our music academy. That’s what our Lord calls you to do in your vocation as you serve others. 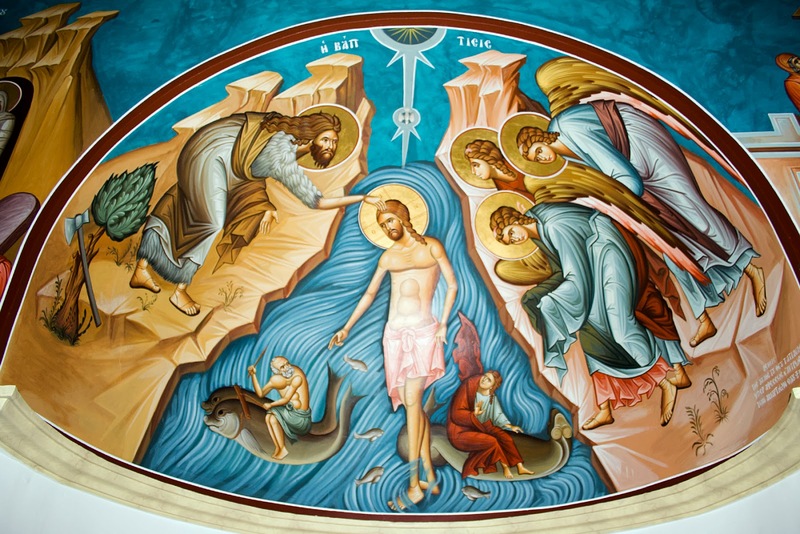 And just like John, we find an oasis and a haven in the wilderness in the waters of Baptism, in Jesus. Because Jesus isn’t just beholdable in your confession of faith and life outside this church. John’s words are true inside the church as well. In fact, in many ways you have it better than John. For Jesus is still heard and touched, and seen throughout the holy Christian church. Jesus still eats and drinks with sinners. Behold, the Lamb of God who takes the sin of the world...for you. Sermon for Christmas 2: "Where's Jesus?" Where’s Jesus? That’s the question of the day. Today, Luke’s Gospel reading teaches us where and how to find Jesus. At first it seems like Jesus is lost. Mary and Joseph were going up to Jerusalem for the annual Passover festival, the great sacrifice of the paschal, suffering Lamb who gives its life blood for the people. And notice how Mary and Joseph “go up” to Jerusalem. OT, NT – you always go up to Jerusalem. It’s a geographically and theologically loaded phrase. Of course you must physically ascend the stairs. But the temple, Mt. Zion is also where you go up for the sacrifices, up to the altar, up to where the Lord was present, up to where he delivered his forgiveness and holiness to his people, up to where the Lord’s promises were bestowed, up as God’s redemption comes down. Jesus was there too, the boy-king, the 12 year old God in human flesh. Jesus is brought up to the temple as well, a foreshadowing of his future saving work. A reminder that Jesus’ life begins and ends in the temple. Jesus may come to the temple a boy, but he leaves a man. He knows who he is and what he was born to do. But Mary and Joseph don’t understand everything quite to yet. And when the feast was ended, as they were returning, the boy Jesus stayed behind in Jerusalem. His parents did not know it, but supposing him to be in the group they went a day's journey, but then they began to search for him among their relatives and acquaintances, and when they did not find him, they returned to Jerusalem, searching for him. Behold this child is set for the fall and resurrection of many in Israel, and for a sign that is opposed (and a sword shall pierce through your own soul also), so that the thoughts of many hearts will be revealed. Where’s Jesus? Is he lost? Did he wander off? Was he taken? Is he okay? Where did he sleep? What did he eat? All those questions and more were certainly running like a sword through Mary’s soul, piercing her with anxiety and doubt. So they searched the caravans of Passover pilgrims. They asked friends and relatives along the way. They checked under every camel and cart but still…Where’s Jesus? After 3 days (hold on to that thought for later). There was Jesus, in the temple. In the Father’s house, among the Father’s things. Where else would he be? What seems so obvious to the reader is still unclear to the people around Jesus. The Rabbis, to whom Jesus was listening and asking questions of, were amazed, astonished, flabbergasted at his understanding and his answers. And so were Mary and Joseph. Son, why have you treated us so? Behold, your father and I were searching for you in great distress. And there’s the twist in the story. As it turns out, Jesus wasn’t really the one who was lost. Mary and Joseph were. But in their defense, it’s not like Jesus went running around making clay pigeons and breathing them to life or zapping lightning bolts at kids while playing tag at the synagogue. And even though he amazed the Rabbis at the temple with his biblical knowledge and insight, Mary and Joseph didn’t have a “My Son is a Hebrew School Honor Student” bumper sticker on the back of their camel! Where’s Jesus? In the humble, ordinary flesh and blood of a 12 year old boy. It’s easy to blame Mary and Joseph. But we would’ve have missed that point too. We probably would have lost Him in the crowd. And we certainly would not have understood what He was saying when He said, “It is necessary to be in among my Father’s things.” The incarnation of God is like that. It just doesn’t fit our categories or our way of thinking or our pious religious notions about God. God is Man and Man is God. God is a twelve year old boy. But this is the comfort of Christmas. Jesus knows what it’s like to be one of us. He really is Immanuel – God with Us, and “with us” so hiddenly and humbly that we would not have even noticed Him. But that’s precisely the way God works with us and among us. Not in the seen but the unseen. Not in the powerful and mighty, but in the lowly and humble. A manger, a cross. A child. A teenager. A man. He is us. He is you. He embraces your life in all its humanity. He even knows what it’s like to be chewed out by your parents and not have done anything wrong! God’s hiddenness is not understood today, nor can it be. Who Jesus is and what He has done must be revealed to us and seen through the gift of faith. There’s no other way. Mary treasured these things up in her heart. And that treasured up Word had its way with her, creating and enlivening a living faith in her Son, God’s Son. Left on our own to find Jesus we’d be just like Mary and Joseph – lost. Lost in sin. Lost in doubt. Lost in our worry and anxiety. Lost in our lostness. Like Mary, Jesus must speak his word to us. He must reveal to us our lostness of sin and then find us again in His Word of forgiveness. That is why Jesus was in the temple that day. He was in the Father’s house among the Father’s things for you. For us who have the attention span of 12 year old boys, Jesus was perfectly attentive to God’s teaching. For us who have disobeyed every letter of that Law before we were age 12, Jesus knew every word – and kept every word of that Law for you. For us who fail so often to remember the Sabbath day by keeping it holy, by hearing God’s Word regularly and rejoicing in it, 12 year old Jesus rejoiced in hearing and learning God’s word every day. For us who fail so often to honor our father and mother, no matter what age we are, Jesus honored both his Heavenly Father and went down to Nazareth with Mary and Joseph and was submissive to his earthly parents. Already at age of 12, Jesus obeyed the Father’s will, just as he obeys the Father’s will later on the cross. Already at the age of 12 Jesus knows who he is and why he came among us: to keep the Law, to lay down his life, to redeem us, to be our Passover Lamb. All of this he did, not for his own sake, but for us and all sinners who, like Mary, worry, doubt, sin, and don’t understand Jesus until he reveals himself to us and for us. Jesus is exactly where he is supposed to be – in his Father’s house. Or rather, as the text actually says: It is necessary for me to be in my Father’s things. What things? The lampstand, the altar of incense, the altar for whole burnt offerings, and so forth. Jesus is in the temple, in the midst of the Father’s things that render God’s people clean through blood, reconciling them to the Father that they might bring their prayers and petitions to Him. Everything that was true about the temple is now found in Jesus. Jesus is where you go to find God. Jesus is your holiness, your cleansing, your redemption, your forgiveness. He hears your prayers and prays for you. Jesus is your temple. And so the story ends where it begins. The next time Jesus went up to Jerusalem, he went there to die. The next time Jesus goes up to Jerusalem to celebrate the Passover, He became the Passover Lamb, sacrificed for your sins, my sins, the world’s sins. The next time Jesus goes up to Jerusalem he would be lost again. Or so it would appear. But after three days Jesus is found alive again. Why were you looking for me? Did you not know that the Son of Man must suffer, die, and on the third day rise again? Right where he promises to be for you, in his temple, his body and blood for you. In his Church for you. In the holy place where His Word comes to you. Where's Jesus? In the same hidden and humble ways. In Baptism, Word, and Supper. So easily ignored, despised, rejected. As easily rejected as a twelve year old kid in the temple. But God’s Word says there is something more than meets our eyes, our senses, our reason. This is the power of God to save. God in the Flesh come to save us. A perfect obedience to the Law that is yours not by what you do but by trust in what Jesus has done for you. That’s where Jesus is. And today, because Jesus was found in the Father’s house, you are found in his, now and forever. Sermon for Name and Circumcision of Jesus: "A New Year and a New Name"
Notice the common thread woven in that tapestry of Scriptures? God’s name. God’s name given for us. God’s name blessing us. God’s name saving us. God’s name upon our lips. And today…on the eve of the Festival of the Name and Circumcision of Jesus…God’s name given to an eight day old boy who is God in human flesh. What’s in a name?” Shakespeare’s Juliet asked. And you may well be wondering the same. What’s in a name? Why does the Church have an entire festival dedicated to the name and circumcision of Jesus? What’s the big deal? Just think about how much time and thought parents put into naming their children. 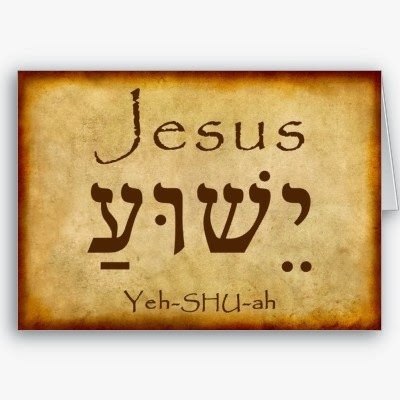 Names are important– they’re our identity, it’s who we are, names place us into a family; and most parents choose names for specific reasons, mine for example means “His Name is God” (as in the OT Creed, the great Shema). Or my daughter Zoe: it’s the Greek word for life. And as important as our names are, how much more so is the name of God. That little 8 day old bundle of human flesh was given a name. Yeshua or Joshua in the Old Testament (that’s what those scribbly lines are on your bulletin cover). Jesus means Yahweh Saves. For he will save his people, he will save you, from your sins. For that is what he was born to do. He was born to live for you, suffer for you, and die for you. He was born to receive a name so that he might take your name upon himself. Jesus. YHWH saves. This is the Name sends the Devil running away. This is the Name by which prayer is heard. This is the Name by which God in the flesh is known, the name by which we are saved. The Name of Jesus is the name you need. 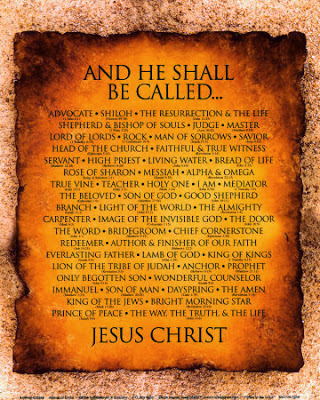 For without the Name of Jesus your only name is sinner. It is precisely for you, that this child is given the Name, Jesus. Mary’s child is named Jesus in order to place his name upon you. God becomes a child in order to make us children of God. 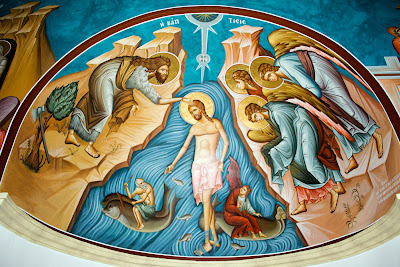 God takes a human name in order to save us from our name – sinner – and give us a new name: Baptized. And without this new name we’re worse than orphans. We are nameless. Without the name of Jesus placed upon us we are only slaves, numbers in a vast death march. No name. No identity. No family. No place to call home. That’s the deadly reality of our sin. We deny the Name of our Lord. Our sinful flesh only worships one name, one god: me, myself, and I. And isn’t that the root of all kinds of evil? A world run amuck, full of people like us who want nothing more than to make a name for themselves at any expense. A world full of people like you and me who think: “What’s in it for me?” We carry that name sinner with us into family gatherings, church meetings (the official and unofficial ones), and everywhere we go. We need more than a New Year with a clean slate. We need a new name. Therefore, begin this New Year not with endless resolutions but with continual repentance. Repent of your name sinner. Repent of placing your name above your neighbors’. Repent of failing to call on the Lord’s Name. In Christ’s Church we don’t live on resolutions, but in repentance…and in rejoicing. Rejoice this New Year in a new name, the Name given for you: Jesus, Yahweh saves! Rejoice, for no matter how often you fail to keep your resolutions – God has resolved to save you in the Name and Circumcision of his Son, Jesus. Rejoice that no matter what kind of pain, sorrow, or grief this New Year brings – all of it has been experienced for you by the boy, the teenager, the man named Jesus. Rejoice that no matter how great your sin is, Jesus’ Name is greater than your sin. Remember that little verse from Exodus 20:24. Commit it to memory this New Year: Wherever I cause my name to be remembered there I will come among you and bless you. A new name for a new year, and a new creation. 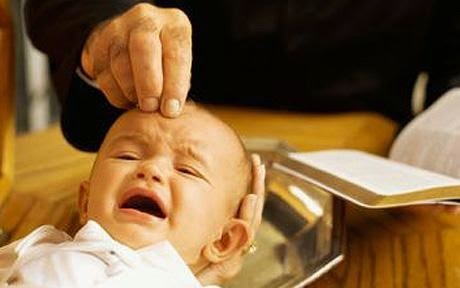 So as we watched the Toy Story trilogy for the umpteenth time this past week I couldn’t help but think of Baptism. In the movie, Andy, the main character, writes his name on the foot of each toy. Why? Because having Andy’s name on your foot means you belong to him, you are loved and cared for, you are his own treasured possession; it means you’re family, and he’ll do anything to keep and protect you. This is what Christ has done for you in Holy Baptism. He is your Andy. But instead of a black sharpie, Jesus takes the best permanent marker there is – his own precious blood – and he engraves forever His name upon your forehead. Out with your old name and in with the new: Baptized. Beloved. Holy. Saint. God’s own child, I gladly say it. You belong to Christ now. You’re loved and cared for by Jesus. You’re Jesus’ own treasured possession. You’re part of the family, adopted in Baptism and given his Name and all the rights of children – an eternal inheritance. Jesus has done everything to keep and protect you, even laying down his own life for you. So the next time you’re in the bathroom look to the place where God’s name is placed upon you with blood and water. You may not be able to see it in the mirror, but it’s there all the same. You are forever marked as one redeemed by Christ the Crucified. Fast away your old sin passes…hail, your new name, lads and lasses. Christ Crucified has taken away your sin and given you a new name. For wherever he places his Name he is there to bless you. It was true in 2013 and it will be true in 2014 as well. The name of Jesus’ doesn’t go out of style. His forgiveness isn’t some passing fad or trend. This gracious, outrageous forgiveness is timeless, just as His name declares. His Name is Jesus for he saves you from your sins.